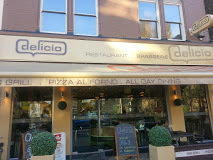 My husband and I stopped off here for coffee one morning to Delicio’s in Eltham High Street, and enjoyed the friendly service so much we returned the same evening for an evening meal with our daughter and her fiance. The waitress remembered us and made us welcome. It made us feel like really valued customers. The restaurant was warm and very clean. The menu contained a wide choice of dishes. Our order was taken promptly. Our first courses included fish cakes, deep fried brie and also hummus. They were all very tasty. The main courses we chose were also varied. These included lamb kebab, pizza and falafel burger. We all had soft drinks. We enjoyed a good meal with good company. There was only one fault with the service: my husband was offered a choice of fries or rice with his meal. He ordered fries, but the meal came with rice. When the mistake was pointed out to the waitress, she did not take the meal away and have the error corrected, she ordered an extra portion of fries from the kitchen. When our bill came, it included an extra side order of fries. I did feel this should have been absorbed by the restaurant, rather than the error passed on to the customer. This action did take the shine off my experience here. This is a small family run restaurant. 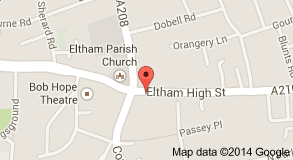 It is warm, the staff welcoming and the menu wide and varied. 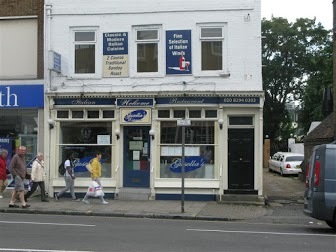 When my husband and I recently visited London, England, our elder daughter suggested we go to Gusella’s on Eltham High Street, for a family meal. There were six of us, so she booked a table in advance. This proved to be a very wise precaution. We were there on a Friday evening and the restaurant was busy. Nevertheless, the service was friendly and unhurried. The menu includes a wide variety of Mediterranean dishes. There are also main course specials, but none of these was vegetarian. Indeed, there is not a wide choice for vegetarians, the options that are available are very tasty. Access for disabled people is very good. The restaurant is bright and clean. Each of us had a starter, just salads or brushetta. We all enjoyed them. Our main courses were more varied. Our choices included Cypriot slow cooked lamb, a seafood platter, pasta dishes and chicken. The men all drank beer, the ladies had gin and tonic or soft drinks. Some of finished our meal with tea and coffee. We thoroughly enjoyed our meal, the company and the surroundings. This is a restaurant that we will certainly make a point of visiting again. I highly recommend it.